The Three Rs: Rants, Raves and (Occasional) Reflections: What's in a Name? 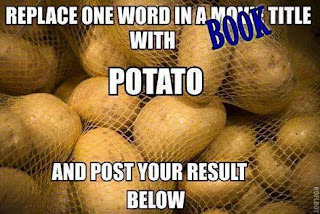 A Bit of Fun, if You Change it to Potato! What's in a Name? A Bit of Fun, if You Change it to Potato! I actually thought about a version of this substituting Presidential candidates' names instead of Potato,. Maybe next time, when the number of candidates should be a bit smaller. U2: Where the potatoes have no name. Another good one! You did several over on Facebook. This one's good! Give us more Australian "Potatoes." Way too much fun but I am not that clever. Now for some strange reason I want to eat some potatoes. See I am so brain dead right now I couldn't even think of that. Lynn, you could do a whole book of this! Gone With the Potato, The Maltese Potato, West Side Potato...just a few of my favorite movies;). It's been fun to do!